Save the dates for our annual Growl-O-Ween party, now at 2 locations! The fun begins at 1:00 PM in front of Three Dog Bakery with our annual Trick or Treating at Town & Country Crossing shops. After the costume parade/trick or treating, we’ll host Bobbin’ for Beg-als. FREE refreshments for pups and people. Cost is $5 per dog with proceeds benefiting Five Acres Animal Shelter. If you can’t make it at 1:00 PM, bring your pet in costume into the bakery until 6 PM. All pets in costume will be entered into a drawing to win a basket of droolicious treats! This pet costume contest will leave you feeling fur-icous! We invite you and your furry friend(s) to show off your best Halloween costume and strut your stuff through the Delmar Loop. Parade-Day Check-In Location: Market in The Loop, 6655 Delmar Blvd, University City, MO 63130. Enter your pet (and yourself) with a suggested donation of $5 to benefit Gateway Pet Guardians. Inside Three Dog Bakery, we’ll have FREE refreshments for pups and people as well as Bobbin’ for Beg-als. 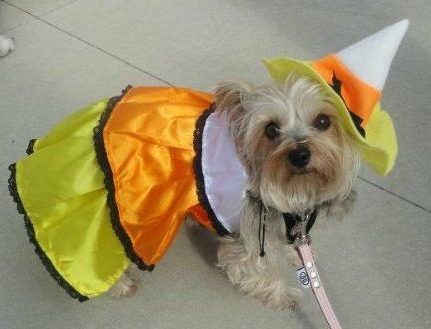 All pets in costume will be entered into a drawing to win a basket of droolicious treats!